Click on the image to the left to view the 2017-18 District Achievement document for the School District of Amery. 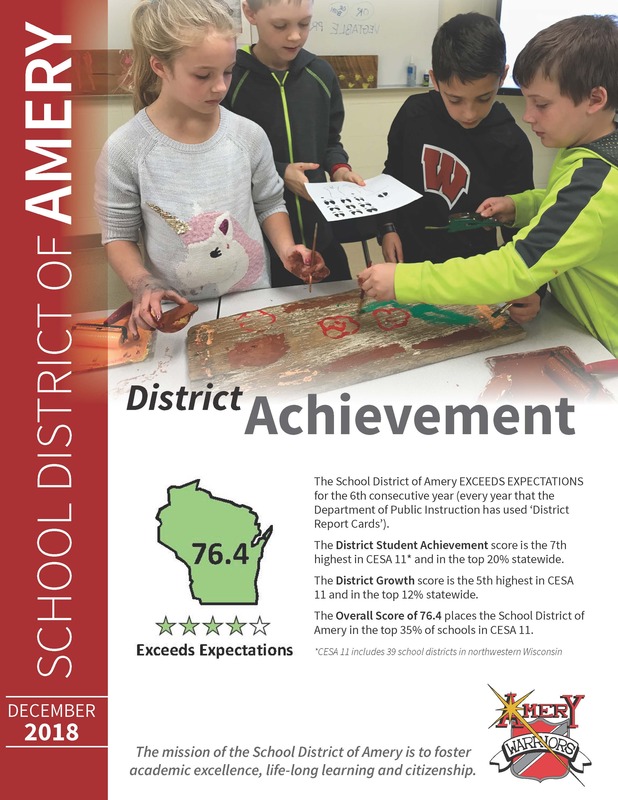 The School District of Amery EXCEEDS EXPECTATIONS for the 6th consecutive year (every year that the Department of Public Instruction has used ‘District Report Cards’). The District Student Achievement score is the 7th highest in CESA 11* and in the top 20% statewide. The District Growth score is the 5th highest in CESA 11 and in the top 12% statewide. The Overall Score of 76.4 places the School District of Amery in the top 35% of schools in CESA 11. For more detailed information about the creation and scoring for the report cards see the resources listed below and additional information available on the about Wisconsin accountability webpage. The Wisconsin School District Performance Report was created in 1991 with the passage of State Statute 115.38. It serves as the State’s comprehensive resource for data on school performance and student achievement. The information provided reflects the previous school year’s data. This is because at the end of each year Wisconsin districts submit information to the state educational office where a comprehensive, state-wide report is generated. The School District of Amery’s School Performance Reports are available on the WISEdash website. Parents or guardians of students enrolled in Amery schools may request that a copy of the Amery School Performance Report be provided to them following completion or you may click on the following links to view the reports.